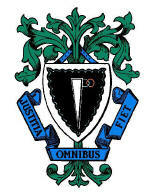 Dunstable and District Local History Society was founded in September 1991 and organises monthly meetings where its large audiences are entertained by a variety of speakers. The current programme is included in the events guide on this website. The society also arranges outings for members during the summer months and publishes a newsletter twice a year which contains authoritative articles on local history. Annual membership costs £8. Entrance fee for non members is £2 per meeting. The society's logo was designed by Omer Roucoux in 1996. 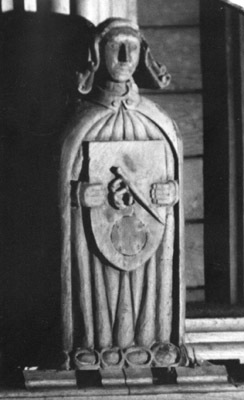 It is a reproduction of the oldest example of the town arms that has been discovered to date. This can be seen, with difficulty, carved on a shield held by the wooden figure in the roof of the Priory Church directly above the pulpit (as seen on the left). 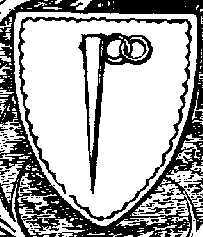 The stake signifies a market, the staple is a pun on the town's name and the ring it secures suggest royal protection. The date of the figure is the later half of the 15th century. 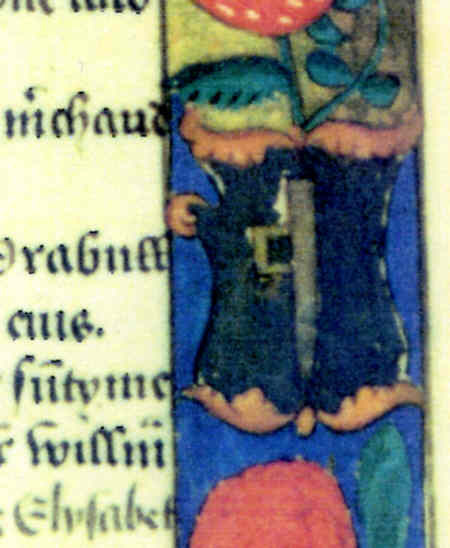 A similar example can be seen in the illuminated border of the Dunstable Fraternity Register for the year 1522 (see pic below). A representation of the old arms was carved on a stone on the corner of Kingsbury House in Church Street, next to the door (below). Fisher in 1836. But on this the staple has two rings attached and faces right (instead of left). Omer Roucoux thinks that the mistake has been made because the engraving (on copper) was done as seen, but when printed it was obviously inverted. 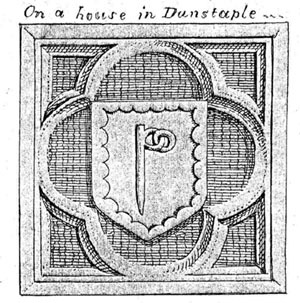 Unfortunately that image was used by historian Charles Lambourn in his Dunstaplelogia in 1859 (left) and adopted by the Dunstable Corporation in 1864 when it chose its arms, including its scalloped edge (left). Apart from the surrounding which has changed, the centre is now still The same. It has been compared to a candle snuffer!